We previously demonstrated, using quantitative content analysis, that successive drafts of the TPD shifted towards the tobacco industry's preferred position.7 We explore how the tobacco industry engineered some of these policy changes. We examine the nature and scale of TTCs’ efforts to influence the TPD revision, identifying key entry points used to access and shape the policy process. We also examine whether Smart Regulation enabled corporate influence on the TPD, as those promoting it intended,21 and whether the application of Article 5.3 is adequate to prevent TTC influence on EU tobacco control policymaking. We analysed a wide variety of materials. First, we obtained 2007–2014 reports, meeting minutes, and press releases from the Commission (http://ec.europa.eu/health/tobacco/policy/index_en.htm), Council of Ministers (http://www.consilium.europa.eu/homepage) and European Parliament (http://www.europarl.europa.eu/news/en/news-room/) websites. Second, relevant web content (including press coverage, media releases and, blogs) was identified prospectively through Google alerts established in 2011 on BAT, ‘Philip Morris International’ (PMI), ‘Japan Tobacco International’, ‘Imperial Tobacco’, ‘Swedish Match’, and ‘Tobacco Products Directive’. Third, internal TTC documents were taken from two sources: 28 PMI documents detailing its strategy to influence the TPD, dated 2011–2013 and leaked to health groups in 2013 (‘PMI's documents’), and 17 (of 323 retrieved) documents obtained from the Legacy Tobacco Documents Library (http://legacy.library.ucsf.edu/) (‘Legacy documents’) using search terms ‘tobacco products directive’, ‘TPD’, ‘tobacco directive’ and ‘impact assessment’, and document dates 2007–2013. Finally, to triangulate the industry documents, identify whether actions detailed were carried out and further examine the TTCs’ political activity, we analysed documents, all dated 2010–2013, released under EU Freedom of Information (FOI) legislation (n=581) or given to the authors (n=2) (‘FOI documents’) and undertook four stakeholder interviews. The majority of the FOI documents were released directly to the authors (n=425) or their contacts (n=109) and are previously unpublished, while others (n=47) were available online at http://www.asktheeu.org (see online supplementary appendix 1). Documents were analysed using a deductive hermeneutic approach,25–27 that is, understanding documents’ content in a wider policy context, while identifying conceptual themes and subthemes (eg, corporate political strategies and tactics) which were repeatedly tested as data collection progressed. Events and meetings, identified from the documents and occurring from 2007 to 2014, were recorded in a timeline to map key developments, identify stakeholders and points of access to EU institutions, and time the Directive's progress through the legislative process. We compared the time the 2014 TPD revision took in each legislative stage, that is, in the Commission, then Parliament and Council, with the original 2001 TPD. PMI alone employed more than 160 lobbyists and spent €1.25 million on lobbying to subvert the TPD.32 At least seven tobacco industry lobbyists were former EU politicians or civil servants.33 ,34 By contrast, Brussels-based health advocates had five fulltime equivalent positions working on the TPD, with a slight increase when the proposal was published in December 2012 (personal correspondence, SFP 12 May 2014). Comparing the health to the tobacco lobby, one MEP likened it to a biblical battle: ‘if you see who is fighting on the left hand side and who is fighting on the right hand side…then you get a shock. It is David and Goliath. It's unbelievable’ (interview MEP, January 2014). FOI documents and Parliamentary and Commission meeting minutes and reports confirm that 12 of PMI's third party coalition partners (11 associations and 1 private company), were actively involved in lobbying the Commission and Parliament, and mobilising opposition.37–45 For example, CEDT established a European retailers’ TPD Working Party which mobilised member state retail organisations.46 ,47 In addition, we identified 126 associations and 33 non-TTC companies (17 public relations and law firms) that voiced opposition to the TPD, through industry stakeholder meetings with the Commission,37 ,48 approaching Commission officials and MEPs with their concerns,49–52 participating in working groups to develop counterstrategies or policy statements,46 ,53 ,54 making critical statements in the media,55–58 and signing anti-TPD petitions59 (see online supplementary appendix 2). 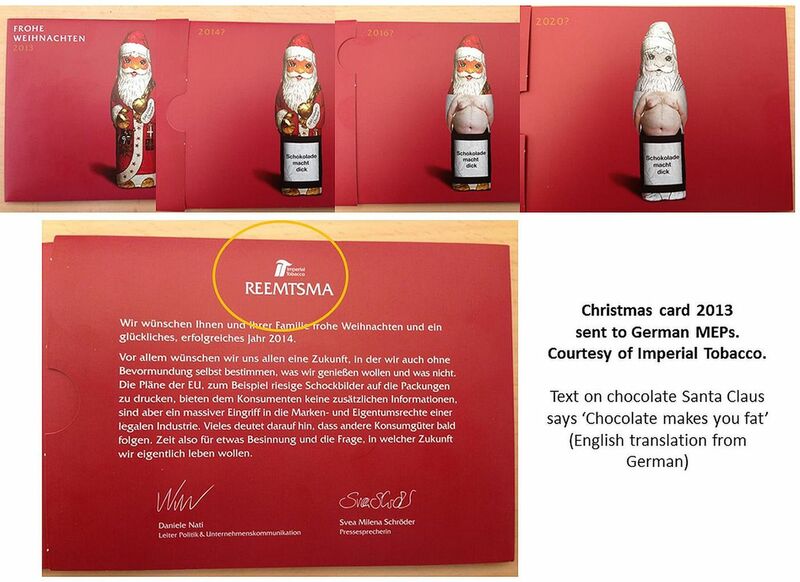 Gifts sent to Members of European Parliament (MEPs) in 2013 to stress the danger of possible ‘spill-over’ effects of Tobacco Products Directive (TPD) measures into the alcohol and food industries. The 2014 TPD followed the usual legislative procedure (figure 2). However, a comparison with the 2001 TPD shows that, while each Directive spent an equal amount of time in the codecision stage, the 2014 Directive spent 3 years longer with the Commission. Legislative process undertaken to review the Tobacco Products Directive (TPD). Source: summary of data collected from the websites of the European Commission, Parliament and Council, accessed regularly between May 2012 and April 2014. AGRI, Committee on Agriculture and Rural Development; CoR, Committee of the Regions; EESC, European Economic and Social Committee; ENVI, Committee on the Environment, Public Health and Food Safety; IAB, Impact Assessment Board; IASG, Impact Assessment Steering Group; INTA, Committee on International Trade; IMCO, Committee on Internal Market and Consumer Protection; ITRE, Committee on Industry, Research and Energy; JURI, Committee on Legal Affairs; SCENIHR, Scientific Committee on Emerging and Newly Identified Health Risks. 1Special Eurobarometer 332 (May 2010), Special Eurobarometer 385 (May 2012). 2GHK Consulting, A Study on Liability and the Health Costs of Smoking, Final Report (December 2009), Rand Europe, Assessing the impacts of Revising the Tobacco Products Directive. Study to support a DG SANCO Impact Assessment, Final Report (September 2010), RAND Europe, Availability, accessibility, usage and regulatory environment for novel and emerging tobacco, nicotine or related products (December 2012), Matrix Insight, Economic analysis of the EU market of tobacco, nicotine and related products (September 2013). 3Smokeless tobacco (February 2008), Additives in Tobacco Products (November 2010). As the proposal needed to be adopted before the Parliamentary elections in May 2014, this slow progress is significant. We identify several potential reasons for it. 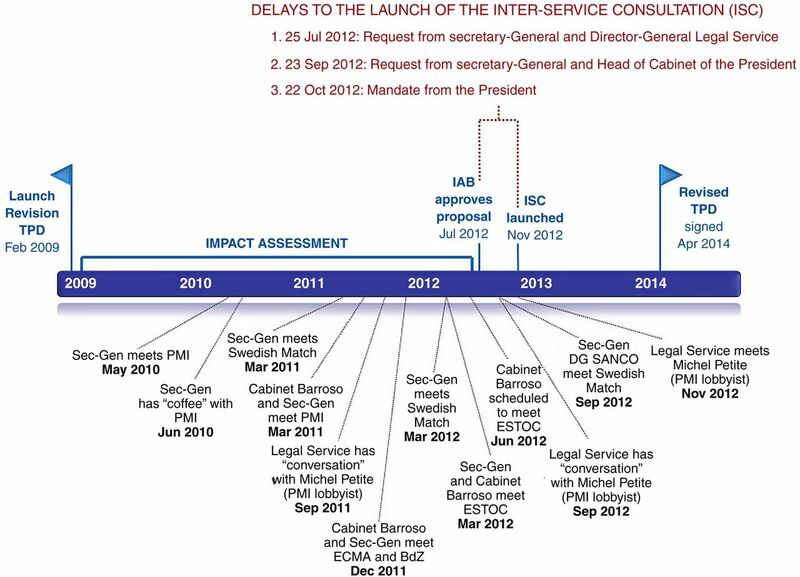 FOI documents identify three specific delays to the Inter-Service Consultation (ISC), the Commission's internal consultation with Directorates-General (DGs) affected by the proposal, linked to events at the highest level of the Commission (figure 3). Delays to the Inter-Service Consultation and linked Undisclosed ‘Meetings’* with the Tobacco Industry. Source: Letters and emails released under Freedom of information requests146–148 and Parliamentary Inquiry.75 BdZ, German Cigar Manufacturers Association; ECMA, European Cigar Manufacturers Association; ESTOC, European Smokeless Tobacco Council; IAB, Impact Assessment Board; ISC, Inter-Service Consultation; PMI, Philip Morris International; Sec-Gen, Secretariat-General; TPD, Tobacco Products Directive. *It is not known whether all meetings occurred in person. First, Secretary-General Catherine Day (the most senior EU civil servant) and Legal Service's Director-General Luis Romero Requena requested that DG-SANCO postpone the ISC launch scheduled for 22 August 201268–70 because there were “A number of substantial issues needing further attention”.66 They claimed that, despite the draft IA having been approved by the Commission's Impact Assessment Board (IAB) on 12 July 2012, not all issues raised by the IAB had been addressed.66 They also alleged concerns with the proposal's legal basis, an argument identified in a 17 August 2012 PMI document as appealing to the ‘sensitivities’ of the Secretariat-General and the Legal Service (see below).30 Emails between DG-SANCO and Day on 7 September suggest that, as a result, DG-SANCO removed plain packaging and the point of sale display ban from the proposal.71 Second, the ISC launch was further delayed on 23 September following concerns by Day and the Chief of Barroso's Cabinet, Johannes Laitenberger, that “it would be best not to launch the ISC until after the October European Council—this is a text that might well leak even from ISC and we are keen to avoid too much controversy before [then]”.72 Third, on 16 October, days before the rescheduled ISC launch on 22 October, Commissioner John Dalli was forced to resign by President Barroso in an opaque cash-for-access scandal, with Barroso mandating that the ISC should wait until a new Health Commissioner was in place.73 ,74 Ultimately new Commissioner Tonio Borg launched the ISC 2 days after taking office, on 30 November 2012, 3 months later than originally intended. On 15 October 2012, OLAF finalised its investigation and forwarded its conclusions to Day.75 The following day and, crucially, days before the launch of the Commission's ISC, Barroso forced Dalli to resign, with the Commission's press statement stating that OLAF found that Zammit had approached Swedish Match using his contacts with Dalli and sought to gain financial advantages in exchange for influence over a possible future legislative proposal on snus.81 The Commission's press statement also noted there was “no conclusive evidence” of Dalli's direct participation, and “no transaction was concluded between the company and the entrepreneur [Zammit] and no payment was made”.81 It also emphasised that Dalli maintained his innocence69 ,82 and in June 2013 the Maltese police stated that there was insufficient evidence to prosecute him.83 ,84 At the time of writing, Zammit's trial is still ongoing. Many questioned whether Dalli's alleged misconduct justified his punishment, given that Dalli had not benefited personally, and the text of the proposal had not changed as a consequence.85 ,86 The Commission's decision came under further scrutiny when the secret OLAF report87 was leaked, presenting only circumstantial evidence against Dalli, retrieved using seriously flawed methods.8 ,88 ,89 OLAF concluded, inter alia, that Dalli's unofficial contacts with snus lobbyists (two meetings in total, both in Malta and occurring at the request of Swedish Match and the European Smokeless Tobacco Council (ESTOC)) had not been publicly disclosed and were a breach of the Commissioner's Code of Conduct and the FCTC's Article 5.3.87 Yet senior staff from the Secretariat-General, Legal Service and Barroso's Cabinet met at least 12 times with the tobacco industry (figure 3), without sanction. 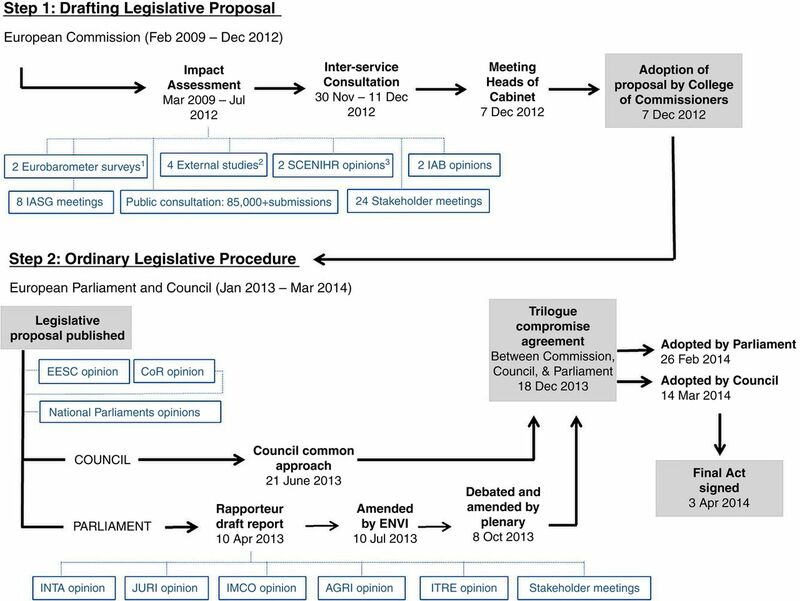 In January 2013, after 4 years in the Commission, the proposed legislation moved to the Parliament and Council (figure 2). To increase the prominence of market versus public health arguments, PMI encouraged the appointment of the Internal Market Committee (IMCO) as co-lead parliamentary committee, alongside the Health Committee (ENVI) which would normally preside over this file. Interview data, however, suggests that Dalli's departure had resulted in rare, all-party support to move the TPD forward, and that to assign IMCO co-chair status would have led to another scandal (interviews, MEP and health advocate, January 2014). As one MEP recalled, “we guessed that the next tactic would be that they shouldn't give [the proposal] to the environment committee [ENVI]…, but it was really a nonstarter…it would have been another scandal…they shot themselves in the foot with that” (interview MEP, January 2014). PMI's documents note that the Dalli controversy negatively impacted their ability to access policymakers.31 FOI documents and interview data confirm that, at least temporarily, it changed the political landscape against the tobacco industry (interviews MEPs and NGO, January 2014). For example, previously amenable DGs120–124 became less inclined to engage with the tobacco industry.125–128 In Parliament, the EPP, on which PMI heavily relied for support,118 decided not to nominate a candidate for TPD rapporteur (the MEP who reports on the proposal and oversees its progress). Instead, in January 2013, Linda McAvan from the Social-Democrats was appointed rapporteur, a choice PMI described as ‘hostile’.31 Interview data suggest that lobbying intensified thereafter, with one MEP describing the tobacco lobby as ‘unbelievably powerful’ (interview MEP, January 2014). Whereas PMI's documents reveal that third parties were ‘activated’ to approach health-friendly MEPs, often hiding their tobacco industry links,35 interview data suggest that former MEPs were purposively recruited to approach MEPs on the basis of being ‘an old friend’ (interview MEP, January 2014). Tobacco-friendly MEPs also attempted to isolate influential MEPs within their own parties who failed to support industry positions (interview MEP, January 2014). Various amendments tabled by MEPs appeared to have originated from the tobacco industry,129 ,130 including amendments on ‘delegated acts’ outlined in PMI's documents.31 One MEP commented that ‘…amendments that came on most of the articles were clearly not written by the MEPs, and they weren't things they would normally have been aware of’ (interview MEP, January 2014). One MEP observed that it was TTCs’ innovative packaging, including lipstick-style packs targeting young women, which swayed Parliamentary opinion, and led to McAvan being given the mandate to move the TPD forward. Our findings demonstrate that the tobacco industry considered the revised TPD a serious threat and mounted a massive lobbying campaign against it. PMI alone employed more than 160 lobbyists and met individually with a third of MEPs before the proposal reached Parliament. Overall the campaign attempted to shift the debate away from health towards alleged negative economic impacts of the proposal and to isolate or weaken those with an interest in health—DG-SANCO and the Health Commissioner within the Commission, and members of the Parliament's ENVI committee. Former EU officials now working or consulting for the tobacco industry played key roles. Lobbying was directed at all three EU institutions, with TTC access and influence in the European Commission secured via its highest echelons, the Secretariat-General, the Legal Service and Barroso's Cabinet. Intervention by the Secretariat-General led both to the removal of the two provisions that industry was most concerned about—plain packaging and a point of sales display ban—and to repeated delays. We also show that these interventions followed repeated, undisclosed contact between senior Commission officials and the tobacco industry in contravention of Article 5.3. As such, PMI's strategy to ‘delay’ or ‘push’ (ie, amend) the proposal appears to have been successful. The evidence presented cannot provide an exhaustive summary of all lobbying activity aimed at shaping the TPD. Although we benefited from the availability of PMI's documents, we did not have access to similar data sets from other TTCs. Nonetheless, it is clear from FOI documents and interviews that other TTCs were similarly politically active, and at times collaborated. Data were also biased towards TTCs’ political activity in the Commission (through FOI documents), and to a lesser degree Parliament (through interviews), while less is known about TTCs’ political activity in the Council stage and at national level. The small interview sample reflects the reluctance of EU officials to discuss the TPD while it was still being legislated. Further, the study does not examine the influence of public health groups although it is clear that some, particularly the SFP, played a key role in securing the TPD's success. Our study has several implications for EU policy. First, the EU's Smart Regulation agenda, specifically its requirements for stakeholder consultation and IA, in which the impacts of policies must be assessed and costed and ‘burdens of legislation’ minimised for ‘economic operators’,19 allowed the industry to frame arguments, engage Commission staff, and delay the Directive's progress. These findings reflect BAT's aims in promoting Smart Regulation tools in the 1990s.19 ,21 Specifically, the requirement that affected stakeholders be consulted early in the legislative process enabled TTCs to input at the outset and overwhelm the process by mobilising the largest ever response to an EU consultation. The Commission's intention to democratise policymaking through stakeholder consultation138 clearly fails to account for the ability of powerful corporate actors to dominate this process. The requirement for a comprehensive IA led to significant delays so that the TPD proposal took 3 years longer in the Commission than the original 2001 Directive. Second, an important difference in TTCs’ activities in the current versus the 2001 directive15 was their extensive use of third-party actors. We identified 137 associations and 34 non-TTC companies that voiced support for policy outcomes favoured by the tobacco industry; 12 were identified by PMI as part of its ‘3rd party coalition’. This increased emphasis on third parties likely reflects an unintended consequence of the adoption of the FCTC's Article 5.3. While DG-SANCO clearly complies with 5.3,139 ,140 other parts of the Commission and some MEPs do not. The fact that senior Commission staff held undisclosed meetings with the tobacco industry, yet cite Article 5.3 as a key reason for Dalli's dismissal shows a misinterpretation and mis-implementation of the Article. Despite the tobacco industry's success in delaying and amending the 2014 TPD, it was still enacted in April 2014 and significantly advances EU tobacco control. Although plain packaging was removed, pictorial warning labels covering 65% of the pack were implemented and represent an increase of 25–30% from current coverage. Interview data and press coverage9 ,12 ,76 ,141 suggest that the industry's aggressive lobbying and its initial receptive response within parts of the Commission, culminating in the forced resignation of Commissioner Dalli, ultimately backfired. Serious questions began to be raised by NGOs about the transparency of EU policymaking and the influence of the tobacco industry in the Commission. Furthermore, the widely publicised leaked documents alerted MEPs to the tobacco industry's tactics, and the possibility that any contact with industry might ultimately be made public. Consistent with previous research,19 ,21 ,22 ,142 we show that the EU's approach to IA and Smart Regulation favours corporate interests over public concerns and economic over health considerations,142 ,143 and can be used to delay and ultimately prevent public health legislation. In contrast, FCTC Article 5.3, which aims to prevent industry influence on policymaking, is poorly understood and inadequately implemented. The Smart Regulation tools must be reviewed to ensure they serve the public and not just corporate interests, uphold Article 5.3, particularly in parts of the Commission not responsible for health and in the European Parliament, and fulfil the EU's broader commitment to transparent policymaking. Evidence that the tobacco industry relied on high-profile former EU officials to secure influence reveals a need to revisit rules on the employment of former Commission staff.144 ,145 With a new Parliament and Commission recently appointed, including the addition of a new Commissioner for Smart Regulation clearly signalling a prioritisation of this agenda, these reviews are urgently needed. This paper demonstrates that third party actors have become an increasingly important element of tobacco industry lobbying and play a central role in attempts to subvert European Union (EU) tobacco control policies. During the Tobacco Products Directive (TPD) review, tobacco industry access and influence was secured via the highest echelons of the European Commission, the Secretariat General, the Legal Service and Barroso's Cabinet. Intervention by these elements of the Commission led both to the removal of the two provisions from the TPD text that industry was most concerned about—plain packaging and a point of sales display ban—and to repeated delays to its progress through the Commission. These interventions followed repeated, undisclosed contact between senior Commission officials and the tobacco industry, signalling that Framework Convention on Tobacco Control (FCTC) Article 5.3 is poorly understood and implemented in the Commission, despite it being a signatory to the Treaty since 2005. This first assessment of how the Smart Regulation agenda affects EU tobacco control policymaking since the system was fully implemented confirms previous concerns that Smart Regulation enables corporate influence, and may thereby undermine EU public health policy. The authors would like to thank all who generously donated their time to be interviewed. The authors would also like to thank those that shared Commission documents released under freedom of information requests other than our own: Fiona Godfrey (Independent Consultant in European Public Health Policy), Smoke Free Partnership, Corporate Europe Observatory, and colleagues at the Tobacco Control Research Group, University of Bath. European Commission. Commission Staff Working Document Impact Assessment. Brussels, 2012. http://ec.europa.eu/health/tobacco/products/revision/index_en.htm (accessed 7 Jan 2013).
. Tobacco-Control Policy in the European Union. In: Feldman EA, Bayer R, eds. Unfiltered. Conflicts over Tobacco Policy and Public Health. Cambridge MA: Harvard University Press, 2004;219–54. The ASPECT Consortium. Tobacco or Health in the European Union. Past, present and future. Brussels, 2004. http://ec.europa.eu/health/ph_determinants/life_style/Tobacco/Documents/tobacco_fr_en.pdf (accessed 9 Apr 2014).
. European Countries and the EU. In: Global Tobacco Control. Power, Policy, Governance and Transfer. Basingstoke: Palgrave McMillan, 2012;72–98. European Commission. Proposal for a Directive of the European Parliament and of the Council on the approximation of the laws, regulations and administrative provisions of the Member States concerning the manufacture, presentation and sale of tobacco and related products. Brussels, 2012. http://ec.europa.eu/health/tobacco/products/revision/index_en.htm (accessed 7 Jan 2013). Directive 2014/40/EU of the European Parliament and of the Council of 3 April 2014 on the approximation of the laws, regulations and administrative provisions of the Member States concerning the manufacture, presentation and sale of tobacco and related products and repealing Directive 2001/37/EC. http://eur-lex.europa.eu/legal-content/EN/TXT/?qid=1399478051133&uri=OJ:JOL_2014_127_R_0001 (accessed 11 Nov 2014). , et al. Quantifying the influence of tobacco industry on EU governance: automated content analysis of the EU Tobacco products directive. Tob Control 2014;23:473–8. doi:10.1136/tobaccocontrol-2014–051822.
. OLAF carried our illegal wiretaping, MEP calls for Giovanni Kessler's resignation. Malta Today 2013. http://www.maltatoday.com.mt/en/newsdetails/news/world/OLAF-carried-out-illegal-wiretapping-MEP-calls-for-Giovanni-Kessler-s-resignation-20130321 (accessed 25 Mar 2013).
. Tobacco debate ‘hotting up’ as Council details leaked to industry. Eur Activ 2013. http://www.euractiv.com/health/tobacco-debate-hotting-council-m-news-519732 (accessed 7 June 2013).
. John Dalli: “You Become a Pariah”. Wall Street J 2013. http://blogs.wsj.com/brussels/2013/06/11/john-dalli-you-become-a-pariah/ (accessed 12 Jun 2013).
. Email correspondence offers murky picture on Dalli's resignation. Wall Street J 2012. http://www.onlinewsj.com/article/SB10001424052970203937 004578079333672961470.html (accessed 20 Jun 2013).
. Tobacco giant Philip Morris’ spent millions in bid to delay EU legislation. Guardian 2013. http://www.theguardian.com/business/2013/sep/07/tobacco-philip-morris-millions-delay-eu-legislation/print (accessed 9 Sep 2013).
. ALDE Priorities for the week of 23 Sept 2013. Parliament Agenda, 2013. 23 September. http://www.vieuws.eu/previeuws/parliament-agenda-alde-priorities-for-the-week-of-23-sept-2013/ (accessed 25 Sep 2013).
. How online sales and promotion of snus contravenes current European Union legislation. Tob Control 2013;22:266–73.
. Block, amend, delay. Report on tobacco industry's efforts to influence the European Union's Tobacco Products Directive (2001/37/EC). Smoke Free Partnership, 2009. http://www.smokefreepartnership.eu/news/block-amend-delay-tobacco-industry-efforts-influence-european-union%E2%80%99s-tobacco-products (accessed 2 Sep 2013). World Health Organization. Framework Convention on Tobacco Control. 2003. http://www.who.int/fctc/text_download/en/ (accessed 19 Mar 2013). Smoke Free Partnership. The origin of EU better regulation—the disturbing truth. Brussels, 2010. http://smokefreepartnership.eu/IMG/pdf/Report_version_27012010_-2.pdf (accessed 14 May 2014). European Commission. Better regulation- simply explained. Luxembourg: Office for Official Publications of the European Communities, 2006. http://ec.europa.eu/smart-regulation/better_regulation/documents/brochure/brochure_en.pdf (accessed 13 May 2014).
. The analysis of company documentation. In: Cassell C, Symon G, eds. Qualitative methods in organizational research: a practical guide. London: Sage Publications, 1997;147–66.
. Archival Strategies and Techniques. In: Qualitative Research Methods Volume 31. Sage Publications, 1993.
. Tobacco and transition: understanding the impact of transition on tobacco use and control in the former Soviet Union. London School of Hygiene and Tropical Medicine, 2005. European Parliament. Procedural file: 2012/0366 (COD) Tobacco and related products: manufacture, presentation and sale. 2014. http://www.europarl.europa.eu/oeil/popups/ficheprocedure.do?lang=en&reference=2012/0366%28COD%29 (accessed 12 Nov 2014).
. Qualitative data analysis in applied policy research. In: Huberman A, Miles M, eds. The Qualitative Researcher's Companion. London: Sage Publications, 2002;305–30. Philip Morris International. EU Tobacco Products Directive Review 17 August 2012. 2012. Philip Morris International. TPD Stage II Master Plan. Lausanne, 11 January 2013. 2013. Philip Morris International. Copy of new Transparency Register. Lists of consultants and their expenses. 2013.
. Letter from Jack Bowles (British American Tobacco) to Ms Draghia Aklia, Director of DG RTD. 7 January [Letter]. Brussels, 2010. Corporate Europe Observatory. Tobacco lobbyist to become European Commissioner? Exposing the power of corporate lobbying in the EU [Blog] 2014; 12 May. http://corporateeurope.org/blog/tobacco-lobbyist-become-european-commissioner (accessed 21 May 2014). Philip Morris International. Stats file. Predicted committee voting outcomes and committee coverage information. Philip Morris International. TPD Core Team meeting. 14 September 2011. Brussels, 2011. European Commission Health and Consumers Directorate-General. Meeting with stakeholders on the study “Assessing the Impacts of Revising the Tobacco Products Directive” prepared by RAND Europe. Summary Record. Meeting date: 20 October 2010, 14:30. Brussels, 2010. http://ec.europa.eu/health/tobacco/events/ev_20101019_en.htm (accessed 11 Nov 2014). European Parliament Committee of Environment Public Health and Food Safety. Participant list of Meeting with Representatives of Stakeholders in the Tobacco Products Supply Chain, 19 March 2013, 12.30–14.30. Brussels, 2013. http://www.europarl.europa.eu/committees/en/envi/events.html?id=other#menuzone (accessed 2 Feb 2014).
. Ref: Social and employment concerns related to the forthcoming review of the Tobacco Products Directive 2001/37/EC and to the Common Agriculture Policy reform. 12 October [Letter]. Brussels, 2012. Global Acetate Manufacturers’ Association. RE: Meeting with [deleted as privacy information]- Follow-up. 8 May [Email], 2012. Mouvement des Entreprises de France. Révision sur la Directive des produits du tabac—Position MEDEF- Comité de la Propriété intellectuelle-. 2012; 7 december [Email].
. Objet: Representants du secteur tabacole europeen-Demande de rendez-vous. 2010; 4 March [Letter].
. Report on the proposal for a directive of the European Parliament and of the Council on the approximation of the laws, regulations and administrative provisions of the Member States concerning the manufacture, presentation and sale of tobacco and related product (COM(2012)0788—C7-0420/2012–2012/0366(COD)). 2013. http://www.europarl.europa.eu/sides/getDoc.do?pubRef=-%2f%2fEP%2f%2fTEXT%2bREPORT%2bA7-2013-0276%2b0%2bDOC%2bXML%2bV0%2f%2fEN&language=EN (accessed 2 Sep 2013).
. EFFAT—UNITAB—FETRATAB/meeting on the post 2013 CAP reform. 2011. 12 September [Email]. EFFAT, FETRATAB, UNITAB. Letter to DG AGRI dated 29 October 2013. 2013. 29 October [Letter].
. Tobacco retailers Position paper on TPD possible revision. 2011. 22 April [Email and position paper].
. Letter from CEDT to Commissioner Ciolos dated 28 September 2011. 2011. 28 September [Letter]. European Commission Health and Consumers Directorate-General. Minutes of the meeting between Commissioner Dalli and representatives of the economic stakeholders active in tobacco products on 7 March 2012. Brussels, 2012. http://ec.europa.eu/health/tobacco/events/index_en.htm#anchor2 (accessed 10 Nov 2014). European Commission Directorate General for Agriculture and Rural Development. Cabinet's meeting with representatives of the European tobacco business, Bruxelles, 20th September 2011, 11h. Brussels, 2011.
. Letter from Unitab to Commissioner Lewandowski dated 23 November 2010. 23 November [Letter]. Brussels, 2010.
. Subject: our conversation yesterday. 5 December [Email]. Brussels, 2012. Polish Chamber of Trade. Official statement of Trade Committee concerning Tobacco Product Directive (2001/37/WE). 2011. 16 February [Position Paper].
. Notes from meeting January 10, 2012 on EU TPD (Tobacco Product Directive). 2012. 10 January 2012 [Minutes].
. Notes from meeting December 14, on EU TPD (Tobacco Product Directive). 2011. 14 December 2011 [Minutes]. Paisley warns of severe job losses at JTI if tobacco directive gets green light. Ballymena Times 2013. 19 November. http://www.ballymenatimes.com/news/business/paisley-warns-of-severe-job-losses-at-jti-if-tobacco-directives-get-green-light-1-5692174 (accessed 20 Nov 2013).
. Lobbyists link EU tobacco curbs to rising crime, Roma. Eur Activ 2011. http://www.euractiv.com/health/lobbyists-claim-tobacco-rules-threaten-roma-news-506560 (accessed 17 Jul 2013).
. Smoking kills- quit now. Tob J Int 2013. http://www.tobaccojournal.com/Smoking_Kills___Quit_Now.51930.0.html (accessed 20 Nov 2013).
. Forest urges retailers to lobby MPs and MEPs on EU Tobacco Products Directive. Retail Times 2013. http://retailtimes.co.uk/forest-urges-retailers-lobby-mps-meps-eu-tobacco-products-directive/# (accessed 29 Aug 2013). Confederation Europeenne des Detaillants en Tabac. Declaration of intentions for a sustainable future of the tobacco sector. 2012. Undated [Position paper]. DG SANCO. Roadmap: revision of the tobacco products directive. Brussels, 2010. http://ec.europa.eu/governance/impact/planned_ia/docs/46_sanco_tobacco_products_directive_en.pdf (accessed 11 Nov 2014). Rand Europe. Assesssing the Impacts of Revising the Tobacco Products Directive. Study to support a DG SANCO Impact Assessment. Final Report. 2010. http://ec.europa.eu/health/tobacco/products/revision/index_en.htm (accessed 11 Apr 2014). Matrix Insight. Economic analysis of the EU market of tobacco, nicotine & related products, Revised Final Report. 2013. http://ec.europa.eu/health/tobacco/docs/tobacco_matrix_report_eu_market_en.pdf (accessed 20 May 2014). RAND Europe. Availability, accessibility, usage & regulatory environment for novel & emerging tobacco, nicotine or related products. 2012. http://www.rand.org/pubs/research_reports/RR211.html (accessed 20 May 2014). European Commission Health and Consumers Directorate-General. Report on the public consultation on the possible revision of the Tobacco Products Directive (2001/37/EC). Brussels, 2011. http://ec.europa.eu/health/tobacco/consultations/tobacco_cons_01_en.htm (accessed 11 Nov 2014). Philip Morris International. EU in Practice. April 11th, 2012. Croatia, 2012.
. Forthcoming legislative proposal on the revision of the tobacco product directive. 25 July 2012 [Letter]. Brussels, 2012.
. Letter from Catherine Day to Swedish Match's General Counsel in response to official complaint made by Swedish Match on 14 May 2012. 2012. 30 May [Letter]. New Europe. New Europe interview with John Dalli. [Video] 2012. 17 October. http://www.neurope.eu/article/exclusive-john-dalli-interview-olaf-resignation-tobacco-directive-video (accessed 18 Oct 2012).
. [WATCH] ‘I expected Barroso to support me’—Dalli. Malta Today 2012. http://www.maltatoday.com.mt/en/newsdetails/news/national/WATCH-I-expected-Barroso-to-support-me-Dalli-20121020 (accessed 11 Nov 2014).
. Dalli: ‘Barroso was against the tobacco products directive’. Malta Today 2014. http://www.maltatoday.com.mt/news/dalligate/36855/dalli_barroso_was_against_the_tobacco_products_directive (accessed 17 Mar 2014).
. Email from Paola Testori Coggi to Catherine Day and Luis Romero Requena dated 7 September 2012. 2012. 7 September [Email].
. Email from Catherine Day to Paola Testori Coggi dated 23 September 2012. [Email]. Brussels, 2012.
. Barroso to MEPs, no work on tobacco review until Borg is commissioner. Malta Today 2012. http://www.maltatoday.com.mt/news/world/22071/barroso-to-meps-no-work-on-tobacco-review-until-borg-is-commissioner-20121023#.U0kxd0ZOUaI (accessed 12 Apr 2014). ‘We need to wait’- Barroso on Tobacco Products Directive. New Europe 2012. 23 October. http://www.neurope.eu/article/we-need-wait-barroso-tobacco-products-directive (accessed 12 Apr 2014). European Commission and OLAF. Replies to the Questionnaire from the Committee on Budgetary Control of the European Parliament concerning the resignation of the former Commissioner John Dalli. Brussels, 2012. http://www.europarl.europa.eu/committees/en/cont/subject-files.html?id=20121211CDT57804 (accessed 9 Apr 2013). European Commission: “Dalligate” spreads like wildfire in Brussels. Presseurop 2012; 25 October. http://www.presseurop.eu/en/content/news-brief/2942321-dalligate-spreads-wildfire-brussels (accessed 21 Aug 2013). Update: No longer Dalligate but Barrosogate- Green MEP. Malta Star 2013; 7 May. http://www.maltastar.com/dart/20130507-dalligate-green-meps-meet-maltese-officials (accessed 2 Sep 2013). Tobacco Control Research Group. TPD: Dalligate. TobaccoTactics, 2013. http://tobaccotactics.org/index.php/TPD:_DalliGate (accessed 6 Nov 2014). Swedish Match. Press Release 3 Feb 2009: Swedish Match and Philip Morris International announce global joint venture to commercialize smokefree tobacco products. 2009. http://www.swedishmatch.com/en/Media/Pressreleases/ (accessed: 5 Sep 2011). European Anti-Fraud Office. Written Record of Interview with Witness: Mr Fredrik Peyron, 2 June 2012. OLAF Final Report no. OF/2012/0617. 2012. European Commission. Press statement on behalf of the European Commission. Brussels, 2012. http://europa.eu/rapid/press-release_MEMO-12-788_en.htm (accessed 16 Oct 2012).
. Dalli claims his ‘entrapment orchestrated from the very beginning’. Malta Independent 2013. http://www.independent.com.mt/articles/2013-06-16/news/dalli-claims-his-entrapment-orchestrated-from-the-very-beginning-1834713088/ (accessed 2 Sep 2013). No criminal case against John Dalli- Police Commissioner. Times of Malta. 8 June 2013. Available from: http://www.timesofmalta.com/articles/view/20130608/local/no-criminal-case-against-john-dalli-police-commissioner.473049 (accessed 19 Feb 2015). Malta rules out legal action against former EU Commissioner. Reuters 2013; 10 June. http://www.reuters.com/article/2013/06/10/malta-eu-commissioner-idUSL6N0EM00020130610 (accessed 11 Nov 2014).
. Comment: the tobacco products directive must not be derailed. Lancet 2012;380:1447–8. Dalligate: Transparency group says Barroso's people met tobacco lobbyists. Times of Malta 2012; 15 December. http://www.timesofmalta.com/articles/view/20121215/local/transparency-group-says-barroso-s-people-met-tobacco-group.449676 (accessed 15 Apr 2014). Giovanni Kessler. Transmission of information following a closure of investigation. Brussels, 2012. http://www.maltatoday.com.mt/en/newsdetails/news/dalligate/Olaf-report-00720130427 (accessed 11 Nov 2014). Ingeborg Grassle. Working document: analysis of the failings of the OLAF investigation. Brussels, 2013. http://www.europarl.europa.eu/sides/getDoc.do?type=COMPARL&reference=PE-510.771&format=PDF&language=EN& secondRef=01 (accessed 10 Nov 2014). OLAF Supervisory Committee. Activity Report of the OLAF Supervisory Committee January 2012–January 2013. 2013. http://www.scribd.com/doc/137703980/OLAF-Supervisory-Committee-Annual-Report-2012 (accessed 10 Nov 2014).
. Open letter—meeting request from tobacco growers from Romania and Bulgaria. 2012; 5 December [Email]. Confederation of European Community Cigarette Manufacturers. CECCM mail on TPD revision. 2012; 11 December [Email]. Confederation Generale des Petites et Moyenne Entreprises. Letter from CGPME to Commissioner Tajani dated 21 September 2012. 2012; 21 September [Letter]. European Federation of Food Agriculture and Tourism Trade Unions. EFFAT submission to DG SANCO on the public consultation on the RAND report and on the revision of the Tobacco Products Directive 2001/37/EC. 2010; 1 December [Position paper]. Institute of Practitioners in Advertising. Re: Institute of Practitioners in Advertising (IPA) states concerns about trademark issues in context with the plain packaging proposals in the Tobacco Products Directive. 15 December [Letter]. London, 2010.
. Letter from the Polish Chamber of Commerce to President Barroso dated 5 October 2011. [Letter]. Przewodniczący Komitetu Handiu, 2010.
. Letter from Confindustria to European Commission President Barroso dated 28 September 2012. 28 September [Letter]. Rome, 2012.
. Letter from Head of de Gucht's Cabinet Marc Vanheukelen to Karla Jones representing ALEC. 2011; 11 June 2011 [Letter].
. Letter from CEDT to Karel de Gucht titled European Parliament Round Table 24.05.11. 2011; [Email]. Oxera. Proposed revisions to the Tobacco Products Directive. A review of the European Commission's regulatory impact assessment. Japan Tobacco International, 2013. http://www.jti.com/how-we-do-business/key-regulatory-submissions/ (accessed 17 Oct 2013). Roland Berger Strategy Consultants. The New Tobacco Products Directive. Potential Economic Impact. 2013. http://www.rolandberger.com/media/publications/2013-04-24-rbsc-pub-The_New_Tobacco_Products_Directive.html (accessed 11 Nov 2014).
. Letter from The European House Ambrosetti to European Commission President Mr Jose Manual Barroso dated 5 September 2012. 5 September [Letter]. Milan: The European House Ambrosetti, 2012. KPMG. Project Star 2011 Results. 2012. http://www.pmi.com/eng/tobacco_regulation/illicit_trade/documents/project%20star%202011%20results.pdf (accessed 23 Jun 2014). Nomisma. The cultivation of tobacco in the European Union and the impact deriving from the Changes in Directive 2001/37/EC. Analysis of socio-economic impact, 2010.
. Crime proofing the policy options for the revision of the Tobacco Products Directive. Proofing the policy options under consideration for the revision of EU Directive 2001/37/EC against the risks of unintended criminal opportunities. 2012.
. Revision of the Tobacco Products Directive 2001/37/EC. 6 December [Letter]. Berlin, 2012.
. Letter from Magyar Dohanytermelok Orszagos Szovetsege to Commissioner Ciolos dated 29 July 2011. 29 July [Letter]. Pocspetri, 2011. Unitab. Invitation to the Cabinet of the Commissioner for Agriculture and Rural Development, for dinner-debate in the presence Mr Marek Sawicki on the theme ‘The future of small farms with intensive workforce requirements in th epost-2013 cap: the case of tobacco-growing’. 20 April [Letter]. Paris, 2011.
. Letter from East Poland House in Brussels to Commissioner Ciolos dated 29 June 2012. 29 June [Letter]. Brussels, 2012.
. RE: Invitation au 33ème congrès de l'UNITAB -18-20 octobre 2012, Budapest -ARES/784077. 9 July [Email]. Brussels, 2012.
. Letter from British American Tobacco to Commissioner Michel Barnier dated 1 June 2011.; 1 June 2011 [Letter]. Boulogne-Billlancourt, 2011.
. Objet: invitation au prochain dejeuner du CPAH. 5 June [Letter]. Boulogne-Billancourt, 2012.
. Philip Morris International invite to presentation of the KPMG study on illicit tobacco trade. 2011; 14 June 2011 [Letter]. Philip Morris International. AA Master File. Background information and meeting details of most MEPs by country. 2012. Philip Morris International. “EU Tobacco Products Directive Review”—strategy meeting presentation II, 17 August 2012. 2012. Philip Morris International. ENVI MEP Stimulator 2.08.2012. Positions of MEPs in ENVI. 2012. Philip Morris International. IMCO MEPs. List of MEPs in IMCO. 2012. Philip Morris International. “ENVI analysis”. 2013. Philip Morris International. “EU Tobacco Products Directive Review”—strategy presentation for meeting 17 August 2012. 2012. European Commission Directorate General Enterprise and Industry. Réunion CECCM 12/07 9h30—10h30. 12 July [Minutes]. Brussels, 2012. European Commission Directorate General Enterprise and Industry. Meeting with GAMA—2012-05-16. 16 May [Minutes]. Brussels, 2012. European Commission Directorate General Enterprise and Industry. Meeting with cigars producers. 15 September [Minutes]. Brussels: European Commission, 2011. British American Tobacco Representation Brussels. Meeting 8 March 2012. 2012; 14 March [Email]. European Commission Directorate General Enterprise and Industry. RE: Meeting with ESTA—02/08/2012. 3 August [Minutes]. Brussels, 2012. European Commission Directorate-General for Enterprise and Industry. Re;Reunion. 18 October [Email]. Brussels, 2012. European Commission Directorate General Enterprise and Industry. Re: Reunion. 1 December [Email]. Brussels, 2012. European Smoking Tobacco Association. RE: Reunion. 2012; 30 November [Email]. European Commission Directorate General Enterprise and Industry. FW: CECCM mail on TPD revision. 12 December [Email]. Brussels, 2012. Corporate Europe Observatory. Tobacco lobbyists all fired up ahead of key vote. Brussels, 2013. http://corporateeurope.org/sites/default/files/attachments/tobacco_lobbyists_all_fired_up_ahead_of_key_vote.pdf (accessed 29 May 2014). Smoke Free Partnership. Comparison of PMI objectives and plenary amendments. Smoke Free Partnership, Brussels, 2013. RE: fabrieksbezoek Philip Morris Holland. 2010 Collection. Bates No: JB0642. http://legacy.library.ucsf.edu/tid/hro18j00 (accessed 12 Sep 2013).
. Impact Assessment herziening Tabaksproductenrichtlijn. 2009 Collection. Bates No: JB0680. http://legacy.library.ucsf.edu/tid/tso18j00 (accessed 3 May 2014).
. RE: Afspraak over ingrediënten van tabaksproducten. 2009 Collection. Bates No: JB0616. http://legacy.library.ucsf.edu/tid/hqo18j00 (accessed 12 Sep 2013).
. RE: Impact assessment herziening Tabaksproductenrichtlijn. 2010 Collection. Bates No: JB0626. http://legacy.library.ucsf.edu/tid/rqo18j00 (accessed 12 Sep 2013). Protocol on the application of the principles of subsidiarity and proportionality, Treaty of Lisbon, in 2007/C 306/01. Official Journal of the European Union, 2007.
. Tobacco directive passes subsidiarity test. Clear The Air News Tobacco Blog [Blog], 2013. http://tobacco.cleartheair.org.hk/?p=7112 (accessed 29 May 2014).
. Update on the Tobacco Products Directive (as of June 2013). 2013; 18 December 20132. http://www.europeancancerleagues.org/tobacco-control/62-tobacco-control-products-directive-in-the-eu/311-new-directive-2013.html (accessed 29 May 2014).
. Lobbying in the European Union. Interest groups, lobbying coalitions, and policy change. Oxford: Oxford University Press, 2013.
. Stakeholder engagement in European health policy. A network analysis of the development of the European Council Recommendation on smoke-free environments. University of Edinburgh, 2013.
. Philip Morris Leads Plain Packs Battle in Global Trade Arena. Bloomberg 2013; 22 August. http://www.bloomberg.com/news/2013-08-22/ philip-morris-leads-plain-packs-battle-in-global-trade-arena.html (accessed 2 Sep 2013).
. The European Union and Health Impact Assessments. Are they an unrecognised statutory obligation? 2008. http://www.safestroke.eu/files/8613/8642/0470/HIA_Report.pdf (accessed 25 Jun 2014). ALTER-EU. ALTER-EU Briefing: review of revolving door rules in Staff Regulations. 2013. http://www.alter-eu.org/sites/default/files/documents/ALTER-EU_Revolving%20door%20rules%20in%20Staff%20Regulations.pdf (accessed 25 Jun 2014).
. FINAL Letter to Barroso on Revolving Doors Commissioners 21 January 2014. Brussels, 2014.
. Meeting on revision of tobacco products directive. 3 May 2010 [Email], 2010.
. Meeting request. Email correspondence between Nuno Jonet and Cabinet Barroso 7–14 June 2011. [Email], 2011.
. Re: request for a meeting. 13 June 2012 [Email]. Brussels, 2012. Contributors The study was conceived and designed by ABG and SP. HC and SP collated the tobacco industry documents, SP submitted the freedom of information requests and collated the web content, and ABG and SP conducted the interviews. SP, with input from ABG and HC analysed the data. ABG and SP wrote the first draft of the manuscript. HC, DS and MM contributed to the interpretation of the data, and revising the manuscript. ABG, DS, HC, MM and SP agree with manuscript results and conclusions. Funding This work was supported by the US National Cancer Institute Grant Number RO1CA160695. In addition, DS is supported by a Wellcome Trust investigator award. The content is solely the responsibility of the authors and does not necessarily represent the official views of the National Cancer Institute or the National Institutes of Health. SP and ABG are members of the UK Centre for Tobacco and Alcohol Studies (UKCTAS), a UK Centre for Public Health Excellence. Funding to UKCTAS from the British Heart Foundation, Cancer Research UK, the Economic and Social Research Council, the Medical Research Council and the National Institute of Health Research, under the auspices of the UK Clinical Research Collaboration, is gratefully acknowledged. Competing interests MM is a member of the European Commission Expert Panel on Investing Health. Ethics approval This study was approved by the ethics committee of the University of Bath Department for Health in the UK. Data sharing statement All freedom of information documents, internal tobacco industry documents, and web content analysed for this paper are available on request.